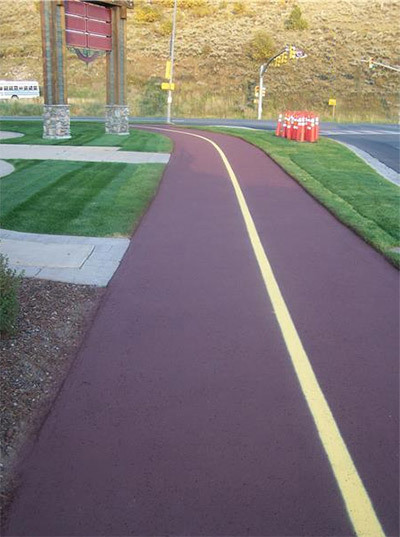 Since 1991, Streetscape Solutions has been the premier provider or decorative asphalt and pavement design services across Utah, Wyoming, Idaho, Nevada, and Colorado. We specialize in commercial and residential decorative asphalt design and stamped asphalt for a wide array of applications, and never fail to deliver uncompromising quality to our customers, no matter the scope of the project. Streetscape Solutions is completely dedicated to transforming your plain and lackluster asphalt into something bolder and more beautiful! We’re the premier provider of stamped asphalt and are pleased to offer expert services that work to turn your asphalt and pavement into works of art. We provide decorative asphalt and pavement services to commercial, municipal and residential customers. No matter the design, color or pattern, our experts have the skills to create a finished product that you’ll admire for years. Whether for purely aesthetic or functional purposes, know that we’re prepared to assist you in your quest for better-looking asphalt. What sets Streetscape Solutions apart from other providers of asphalt stamping, pavement design, and decorative asphalt and pavement is our tenured industry expertise and our use of the finest products available. Our seasoned professionals use best-in-class products from Ennis-Flint and take pride in doing every job to the fullest. We are accredited applicators for both TrafficScapes and StreetPrint. We’re an IPC accredited company. We’re accredited asphalt imprint and traffic patterns applicators. We’re available 24-hours a day to answer your questions! Let us Design Your Asphalt! Whether you need public, private or municipal asphalt design, Streetscape Solutions is here to bring your vision to live! Contact us today to consult with our team of expert designers.